To develop and validate a genetic tool to predict age of onset of aggressive prostate cancer (PCa) and to guide decisions of who to screen and at what age. Analysis of genotype, PCa status, and age to select single nucleotide polymorphisms (SNPs) associated with diagnosis. These polymorphisms were incorporated into a survival analysis to estimate their effects on age at diagnosis of aggressive PCa (that is, not eligible for surveillance according to National Comprehensive Cancer Network guidelines; any of Gleason score ≥7, stage T3-T4, PSA (prostate specific antigen) concentration ≥10 ng/L, nodal metastasis, distant metastasis). The resulting polygenic hazard score is an assessment of individual genetic risk. The final model was applied to an independent dataset containing genotype and PSA screening data. The hazard score was calculated for these men to test prediction of survival free from PCa. Multiple institutions that were members of international PRACTICAL consortium. All consortium participants of European ancestry with known age, PCa status, and quality assured custom (iCOGS) array genotype data. The development dataset comprised 31 747 men; the validation dataset comprised 6411 men. 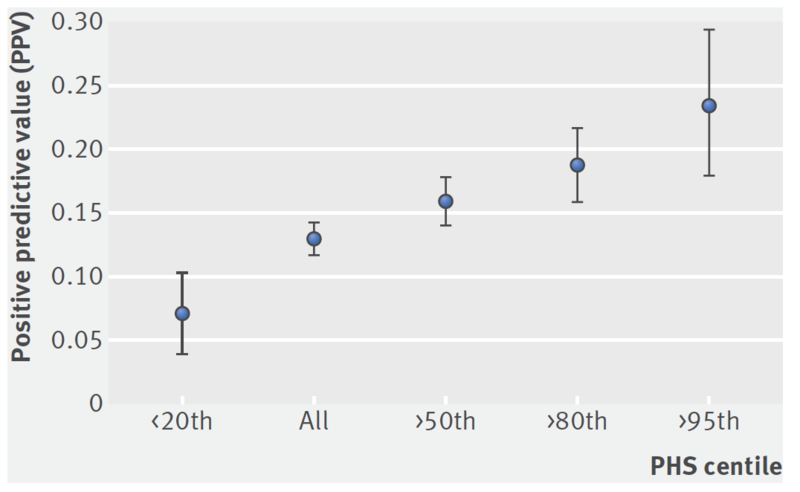 Prediction with hazard score of age of onset of aggressive cancer in validation set. In the independent validation set, the hazard score calculated from 54 single nucleotide polymorphisms was a highly significant predictor of age at diagnosis of aggressive cancer (z=11.2, P<10−16). When men in the validation set with high scores (>98th centile) were compared with those with average scores (30th-70th centile), the hazard ratio for aggressive cancer was 2.9 (95% confidence interval 2.4 to 3.4). Inclusion of family history in a combined model did not improve prediction of onset of aggressive PCa (P=0.59), and polygenic hazard score performance remained high when family history was accounted for. Additionally, the positive predictive value of PSA screening for aggressive PCa was increased with increasing polygenic hazard score. Polygenic hazard scores can be used for personalised genetic risk estimates that can predict for age at onset of aggressive PCa.